That's what we have - four causes of a solar eclipse. And how does Rashi explain this passage? לא שמעתי טעם בדבר - "I have not heard any explanation for this." Another attempt to explain the Talmud was offered by Jonatan Eybeschutz (d. 1764). In 1751 Eybeschutz was elected as chief rabbi of the Three Communities (Altona, Hamburg, and Wandsbek), and was later accused of being a secret follower of the false messiah Shabtai Zevi. In January 1751, Eybeschutz gave a drasha Hamburg in Hamburg in which he addressed the very same problem that the Maharal had noted: if a solar eclipse is a predictable event, how can it be related to human conduct? His answer was quite different: The Talmud in Sukkah is not actually addressing the phenomenon that we call a solar eclipse. 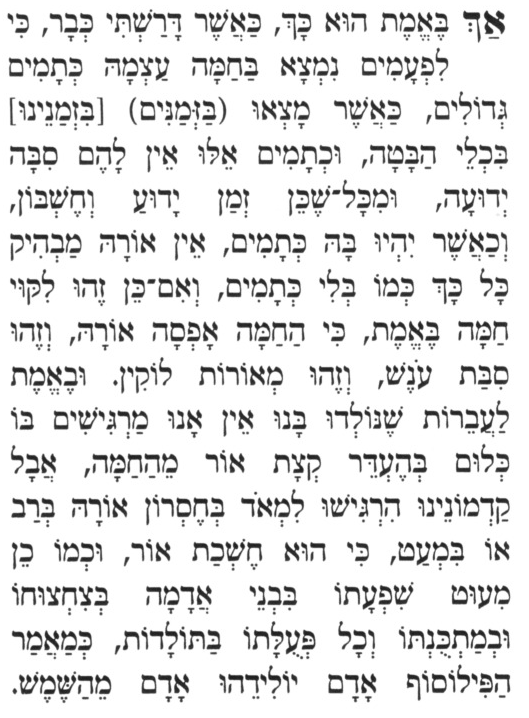 According to Eybeschutz, the phrase in Sukkah "בזמן שהחמה לוקה" actually means - "when there are sunspots." Inventive though this is, it is as implausible as the suggestion of the Maharal. In the first place, sunspots were almost (but not quite impossible) to see prior to the invention of the telescope. They were described in March 1611 by a contemporary of Galileo named Christopher Scheiner (though Galileo lost no-time in claiming that he, not Scheiner was the first to correctly interpret what they were.) Because sunspots were so difficult to see with the naked eye, it seems unlikely that this is what the rabbis in Gemara Sukkah were describing. Second, according to Eybeschutz, sunspots "have no known cause, and have no fixed period to their appearance". We can't fault Eybeschutz for his first claim, but - even by the science of his day - his second was not correct. In fact both Scheiner and Galileo knew - and wrote - that sunspots were permanent (at least for a while) and moved slowly across the face of the sun. It's interesting to note that Galileo got very excited about the discovery that the spots moved across the face of the sun. This suggested (though it did not prove) that the sun itself was spinning. Galileo had also discovered that Jupiter was orbited by moons. Both of these discoveries now added further support to the Copernican model in which the Earth was spinning on its own axis, and was not the center of all the movement of objects in the sky. But Eybeschutz did not believe Copernicus was correct: "Copernicus and his supporters have made fools of themselves when they declare that the Earth orbits [the Sun]. They have left us with a lie, and the truth will bear itself witness that the Earth stands still for ever." Eybeschutz wanted to have sunspots explain away a talmudic mystery, but he dismissed the evidence that they provided in other matters - namely, that the earth moves. Was the Plague of Darkness a Solar Eclipse? Since we are only a couple of weeks before פסח, we will end with another look at an old theory, in which the Plague of Darkness was caused not by a miracle, but rather by a (conveniently timed) solar eclipse. In 1916 Eduard Mahler (d. 1945) suggested this explanation in his Handbuch der Jüdischen Chronologie, (Vienna 1887). According to Mahler, there was a solar eclipse visible in Egypt on Thursday March 13, 1335 BC. Since this was the only such eclipse, it would date the Exodus as occurring on March 27th, 1335 BC. (22) there was a thick darkness in all the land of Egypt for three days. (23) They did not see each other, or get up from their places for three days. (22) there was a thick darkness in all the land of Egypt. (23) For three days they did not see each other, or get up from their places for three days. The eclipse lasted only a few minutes, but its effect on the Egyptians lasted three days. And what about the Jews in Goshen -why was there no Plague of Darkness there? Because they lived outside of the totality - the area in which the complete eclipse occurred - and would not have noted any significant darkening. Now there are some problems with this theory - like the fact that according to NASA, the solar eclipse to which Mahler referred seems to have been only a partial eclipse throughout Egypt. Still, it makes for a good discussion. Try that at your Seder Table. Older PostKetuvot 41 ~ Good Dog. Bad Dog.